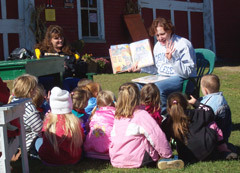 Kindergarteners relax after lunch with a pumpkin story. The “MAN’S BEST FRIEND” Corn Maze is a fantastic activity for all ages & types of groups. From pre-schoolers to adults, it is a terrific opportunity to stress team building & work on physical fitness. It is both a workout for the mind as well as the body. Many of the Vermont Standards skills may be addressed with this type of adventure. Our Livestock Barn is a great place to introduce children of all ages to farm animals & teach them a little about each breed & farming in general. For school groups, if you’d like an actual presentation on farm animals or the type of farming practices we use here to correlate with what you might be studying in school, just let us know. We can usually accommodate whatever topic & age group you have. We particularly like to stress the significance of heritage breeds for today’s agriculture as well as the importance of locally grown foods. Depending on the ages of your group members, we can give a Farm Tour where we talk about each of the types of animals we have & what they are used for. Also in our Livestock Barn, NEW THIS YEAR, we have HATHAWAY’S HENs OUR SINGING CHICKEN SHOW!! There are a couple different shows with songs & interactive activities for the kids. Our Milking Cow Contest is very popular as well with a dairy cow background that is NEW THIS YEAR. Beginning about mid-September, the Pumpkin Patch should be ready for Pick-Your-Own pumpkins. You can have a wagon ride to & from the Patch & pick a great pumpkin! Pumpkin Rule: Everyone must carry their own pumpkins. A fun activity is to have a pumpkin decorating contest by drawing on them with markers & then having the class vote on some different category winners. 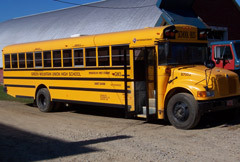 Over the past several years we have had well over 100 different groups per year visit our Farm & Corn Maze. These groups include schools (pre-schools through colleges), scouts, camps, church groups, 4-H clubs, boys & girls clubs, birthday parties & more. We are an ideal setting for adventurous explorers of all ages! This is a working Vermont farm where we raise some beef cattle & grow the feeds for all our animals & produce maple syrup. We have always been engaged in agri-tourism (before it ever had that label) way back when we were a dairy farm, to help teach both children & adults about farming & the importance of knowing where your food comes from. We feel it’s important for people to have that connection. Pay with one transaction for the group. Group Discount – To qualifying groups of 20-35 people, we will take $1 off EACH farm admission. Qualifying groups of 35-100 people will receive $2 off farm admission. Please contact us for groups of 100 or more people. Weather: The Farm is open weather permitting. Muddy, slippery ground conditions after rainstorms could possibly force us to stay closed even after the rain has stopped. If the forecast is for 90 degrees or higher for the day, we also close. We will post conditions each day on our Home page (usually by 8am). Please call ahead if you have any questions about the weather in our area. If we need to close the farm due to weather on your scheduled day, you can reschedule your group or come just for the Livestock Barn, whichever you prefer. Don’t forget sunscreen & cameras. We sell drinks during the week & you are welcome to bring your own lunches too. There are picnic tables available. You must have one assigned chaperone per 5 children. For everyone’s safety & enjoyment at the farm, please be sure to review the Do’s and Don’ts with your group before your arrival.